Every year around this time I get really excited about the warm months ahead. I love going to the farmers market, cooking with fresh ingredients, and sharing it all with friends — Hosting parties is one of my favorite summer activities! There are a few things that I always do when hosting that make any party special. If the event is casual, I always ask guests to bring a side dish (so that we don’t have to do all the work). Cooking food for a lot of people is tons of work, so asking for help simplifies the planning piece. I love to bake, so I’ll usually handle the main course and the dessert. 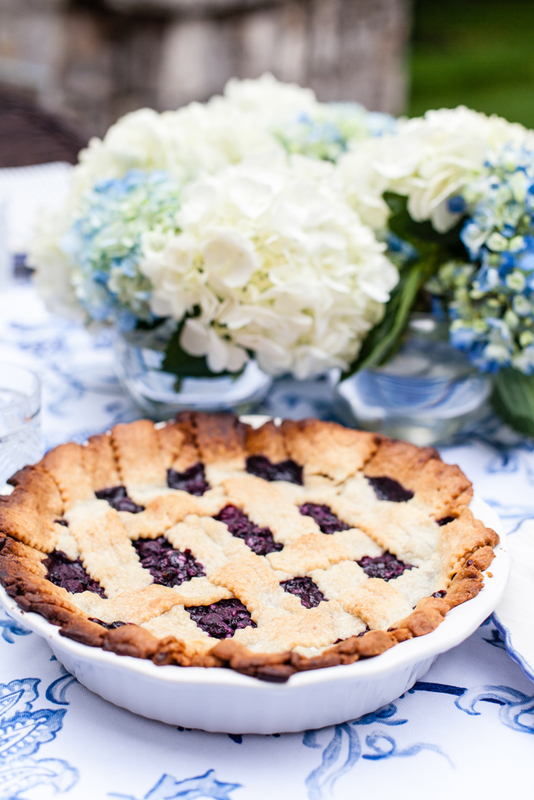 This blueberry pie (Scroll down for the recipe!) is super simple to bake and makes a big impression! It’s so tasty — topped with a little ice cream, it's the perfect summer dessert. A pretty table makes an impact no matter the occasion, so I always dress up an outdoor party with a decorated table. I love finding fresh flowers that compliment the theme of the event. Transform your space with simple details — try a different tablecloth (in a fun color or pattern) every time and let it do all the talking. 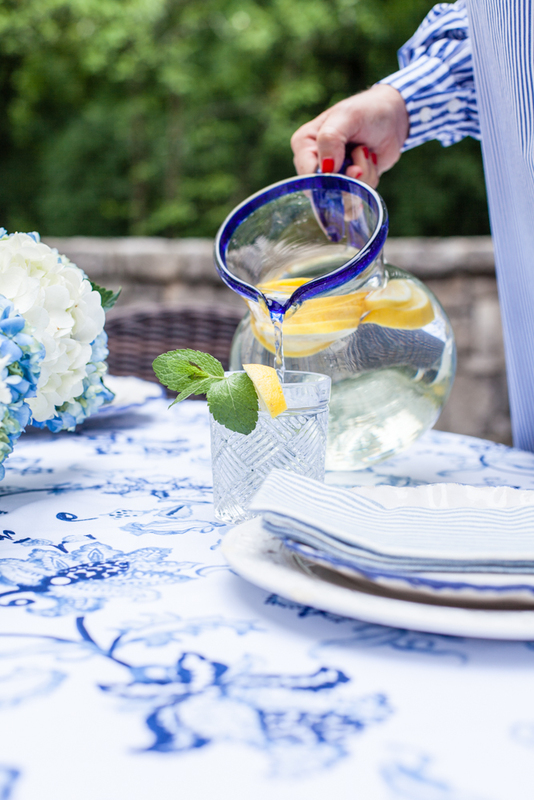 This classic blue & white tablecloth is perfect for Memorial Day! Since it's hot in the summer, I love to host parties when the sun is going down (so guests can enjoy plenty of time outside). 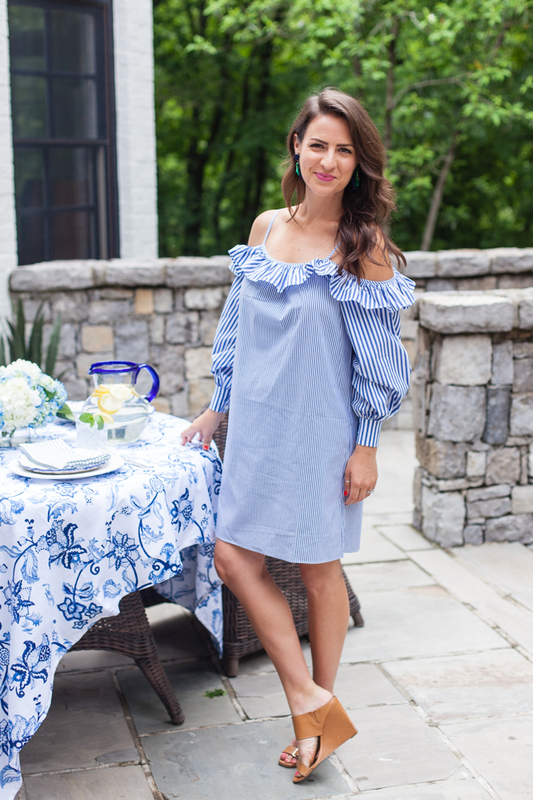 My go-to attire for any summer event? A lightweight sundress. I absolutely love these dresses from Maggy London. They're nice and breezy, but pretty details make them 100% party-ready. 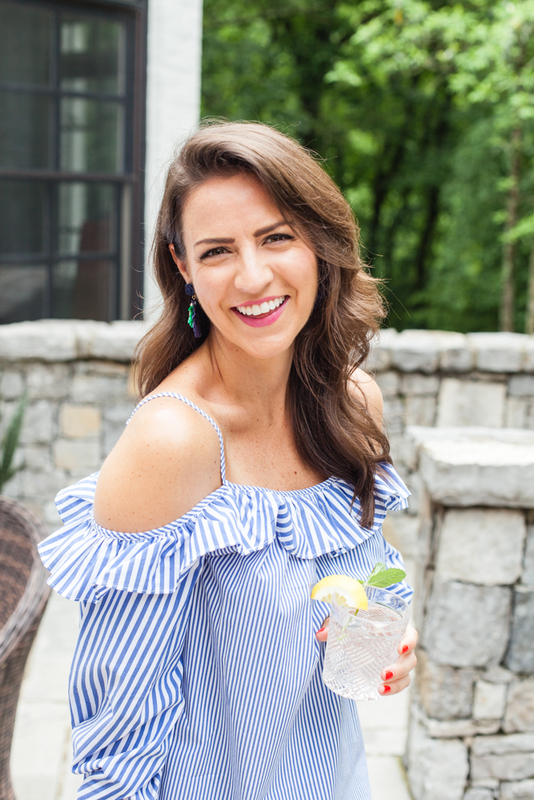 I love spending time with friends when good food and good weather are involved and I think that summer parties are one of the best ways to do that. Preheat oven to 425 degrees. Grease a 9-inch pie dish and set aside. To prepare the crust, whisk together flour, sugar, and salt. Cut the butter into small pieces, about the size of a penny and spread throughout the flour. Using a pastry cutter or a fork, work the butter into the flour. Once the butter is well incorporated, the mixture should look similar to clumpy sand. Gradually stir in the cold water and fold it into the dough with a spatula. You may need more or less water so just keep an eye on it, you want the dough to come into a smooth ball. Now, roll the second disc just as you did the first. Using a knife or pastry roller, cut the dough into 1-inch strips. Begin to place the strips across the pie and then weave the second layer of strips, over and under until you have reached the edge. Pinch the sides of the crust together so the top and bottom crust are secure. Brush the crust with the melted butter. Cook for about 20 minutes until the crust is set. Reduce the temperature to 375 degrees and cook for an addition 25-35 minutes or until the crust is golden brown. If the pie rim browns too quickly at any point, you can cover it with some foil or a pie rim. Allow to cool for 1 hour and serve with your favorite ice cream.